Will "a swarm of umbrellas" protect the Earth from global warming? Roger Angel, at the University of Arizona, apparently hopes so. In Angel's plan, "a trillion miniature spacecraft, each about a gram in mass and carrying a half-meter-diameter sunshade... would act as a mostly transparent umbrella for the entire planet." [Image: The anti-sun space-umbrella cloud, by Roger Angel. Because of the cloud, sunlight is "spread out, so it misses the Earth" – leaving everyone down here pale and confused (but free of global warming)]. 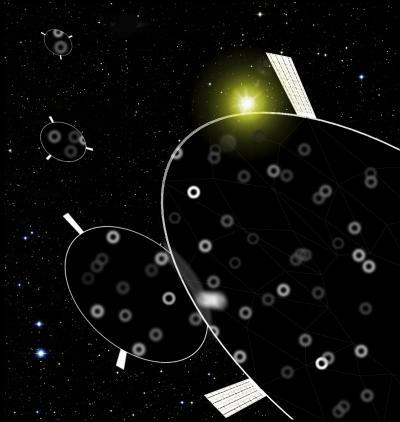 The whole thing "could be deployed in about 25 years at a cost of several trillion dollars," and it "would be accelerated into space by a large magnetic field applied along 2,000-m-long tracks. With each such launch sending out 800,000 flyers, the project would require 20 million launches over a decade." According to EurekAlert!, this actually means "launching a stack of flyers every 5 minutes for 10 years." So will this flying sun-cancellation machine really go live? Shouldn't we perhaps use derelict buildings instead, hurling gigantic anti-sun clouds of ruined architecture into space – empty tower blocks and football stadia and Thames Water filtration plants, all blocking out the harmful rays? Sunlight passing through the windows of churches casts shadows on farms, affecting harvests... and the temperature on earth will never change. (Via Roland Piquepaille, on a tip from Bryan Finoki). Something tells me this scheme is underwritten by Ray-Ban. I mean, how cool could it be to put the earth in shades? 30 trillion of them? It fits. Right down to the reflected glare off the intergalatic highway patrolman's specs. Yeah? Whatever happened to that brand of fake Reebok-looking sneakers called "Stadia"? What a great name for a knock-off brand that was. You're always wanting to hurl architecture into space or at various planets. What is the issue there? Several years ago I had hope that we, as a human race, would come up with a intelligent and efficient solution to save ourselves. Today, not so much. Is it me or is there an underlying tone of utter helplessness associated with this concept. I hope we can figure this out really soon. This strikes me as (yet another) insanely bad idea, not merely for the obvious reason mentioned above (i.e., needless pollution of our orbital space), but for the knock-on environmental/energy effects that would result from it. Particularly, as in the 21st Century the world finally wakes up to the idea of moving away from fossil fuels and towards renewable energy sources, where is the sense in a 'solution' to global warming that undermines the planet's ability to harness solar energy through photovoltaics? But I also agree with parallax. Or maybe we should invest in making a giant pair of sunglasses that would fit the sun. Perhaps Earth should try to win an N.B.A. Championship. These schemes all sound so way, way cool and intelligent. But of course they raise the question, what happens if we throw too much junk up there? Do we railgun some towelboys up into space, to jet around furling tiny umberellas until their air runs out? The obvious answer is to use mirrors instead, bouncing the solar to a microwave converter, then beaming it down to earth to generate power here. This would effectively solve the two major hurdles to massive use of solar power: we could then charge for it, and, if the concentrated beam wanders, it becomes extremely dangerous. Once solar energy is deadly and can be run through a meter, the nuclear companies will trip over themselves to jump on the bandwagon. You know instead of tossing random architechture out in space you can pretty much just toss Detroit up there. Anon - Then what would happen? we lose a decent basketball team. Lets chop Bush up into little pieces and send him up there too! but this time, George, Global Warming really is coming! theres a petition to name a sewage treatment plant after george bush on the corner of my block.